Southern California, even mild Orange County where I live, has had over 100 degree heat for the past week, with ever increasing humidity/mugginess, which is very rare for us. The mugginess is all due to Tropical Storm Lidia, approaching us from south of the border. This morning is the muggiest yet. We are supposed to go to the Del Mar races today, for the last time of the summer. There is a strong chance of rain, so I looked outside this morning when I rose to go to the bathroom, and saw a rainbow. 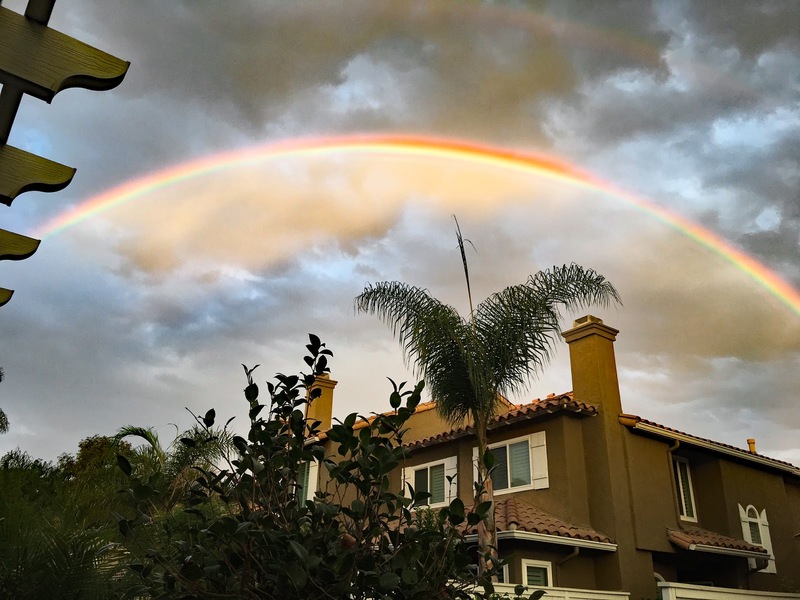 So I walked outside to take a photo, and was shocked to see a FULL spectrum rainbow, with even a hint of it being a double one in the upper right corner! So apparently Lidia giveth, and she taketh away. Even though our seats are undercover, I don’t think I want to sit in super muggy weather, with intermittent bits of rain, and apparently high winds are coming too. Plus, I worry about the safety for the horses, and I’ve seen horses go down at racetracks, and it’s always awful. I dunno. At least it was a pretty sunrise rainbow! This entry was posted in Uncategorized on September 3, 2017 by Silver Willow. That rainbow was a beauty, SW.
A bit early for Hallowe'en, surely? Mind you, we have Thanksgiving before Hallowe'en so that's what appears first in the displays. Wow! That is the most beautiful rainbow I've ever seen! Wow, that is a gorgeous rainbow! Beautiful photo. We once met a woman who said she lived just a couple of blocks from the beach in Del Mar, as I recall. Not sure how far that is from the track. thanks so much, Kathy! Very blessed to have caught it! We went to the off-track racing/sports book restaurant for a very leisurely lunch, then went to Rogers Gardens. The Halloween display was really good, but much smaller than we anticipated, but we still picked up a few items. 🙂 Thanks for asking! Very close! It's just a block or two away from the beach itself! Oh my! When it gets muggy and sticky or hot and wet, just put yourself in a cool room and look at that beautiful photo and perhaps your cares will go to the other side of the rainbow. That's a stunner. Nice rainbow!! I hate muggy and I live in muggy. Hope your lunch was in A/C and a cocktail or two made it all better.